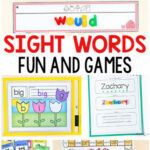 Make learning fun and exciting with these sight word activities that your kids will love! 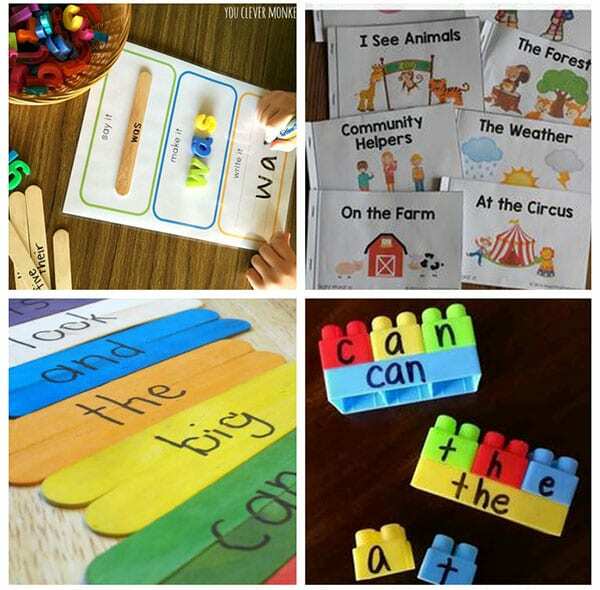 They are all hands-on ways for young kids to learn sight words. Sight words are something that we have been working on a lot lately. So I am constantly on the lookout for awesome sight word activities that I know my son will enjoy. I’ve created a few on my own as well. I thought it would be super helpful for all of you if I shared our favorites with you. This way you can make learning sight words more fun and engaging for your kids too! Make these super cool sight word pockets and kids can work on any sight words you want. They are even reusable so you can change up the words! Your kids will have a blast building sight word towers! 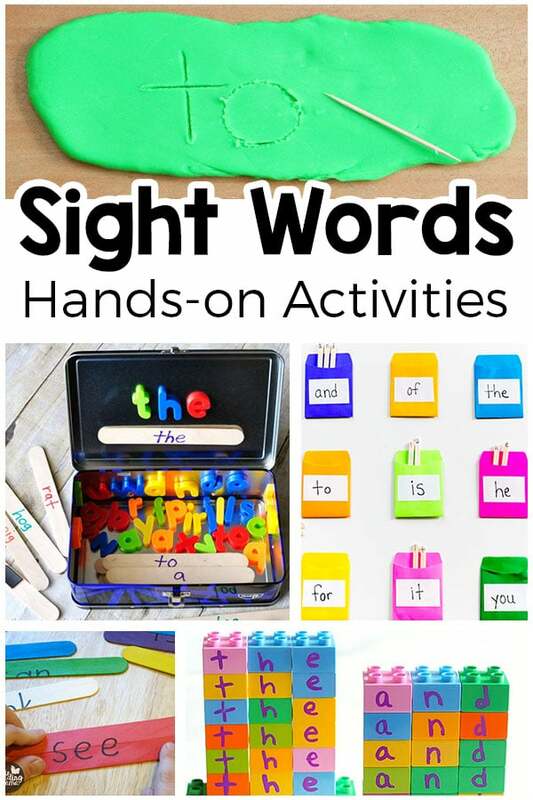 A fun and engaging way to introduce new sight words to kids! 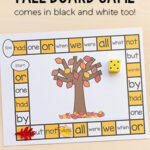 Spell sight words with stamps for a hands-on sight word activity! 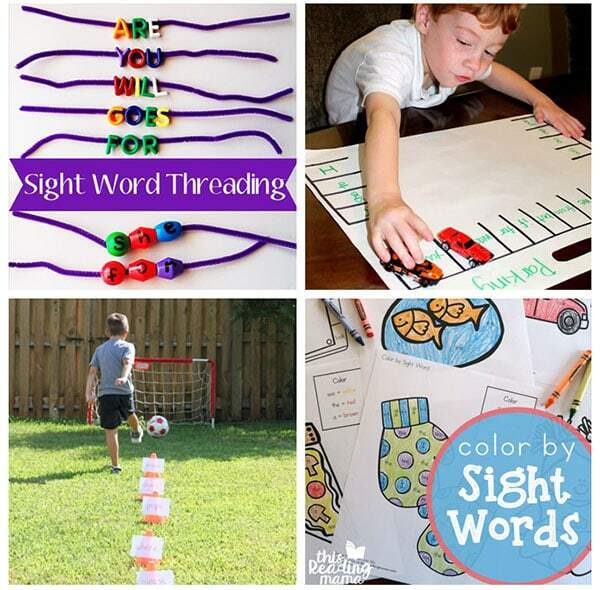 This fun bead threading activity is a fun hands on activity where sight words and fine motor skill practice collide! Car loving kids will go crazy over this diy parking lot game. They can pretend to drive while parking in the correct word. If you have a super active child that enjoys the outdoors more than sitting at a table, this word work soccer game activity may be for them. Kids can outside and play while still incorporating words! Coloring can be both fun and relaxing. Incorporate word work in with these printable color pages for a simple and quiet activity. Sometimes weather prevents our active kids from playing outside. This stand up & play game will get the wiggles out while still practicing simple words. This super fun scavenger hunt is low prep for mamas but unbelievably fun for kids. It’s an activity that can be done over and over with different words each time! If you and your kids love Dr. Seuss books, this hop on pop game is sure to be a hit! It’s a get up and move game, perfect for rainy days! 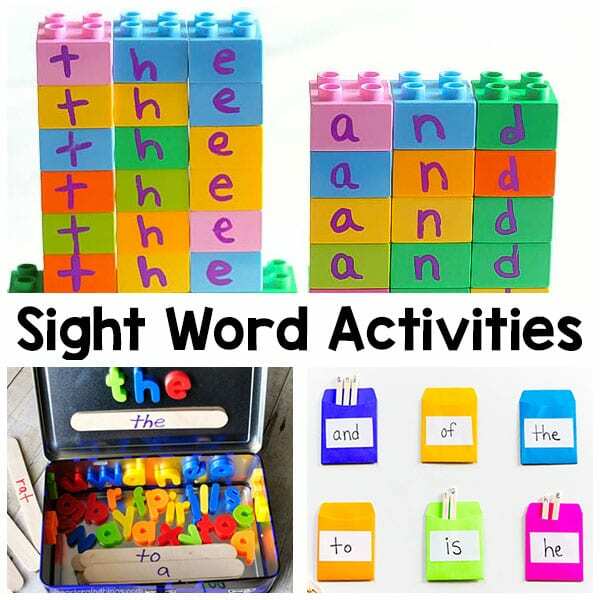 This sensory activity is a perfect combination of sensory and sight words. A fun, different way of practicing writing but no mess to clean up! 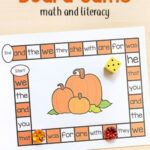 These printable sight word books add a fun spin to learning to read. Each book is a new topic and a new set of words to practice. 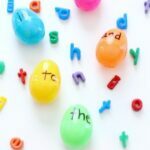 This fun printable sight word activity is basically six activities in one. 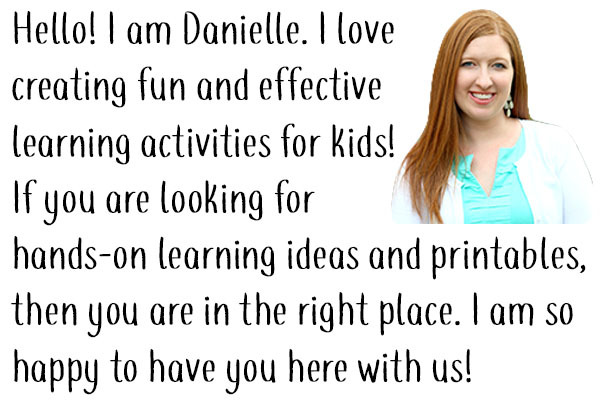 Kids can write, make, say, and more! This fun diy sight word puzzle is easy to make and fun for kids. This set would be great as a busy bag or for on the go as well! This Build A Sight Word is great for the future engineers! It is an activity that can be done by children independently as well! Kids often need to be entertained in places that are not home. 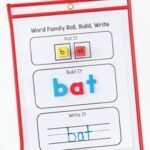 This Word Building Activity Travel Kit is perfect for in the car, at the doctor or a restaurant. Learning activities for kids do not have to be expensive. This slap activity has inexpensive supplies but will supply hours of fun & learning for your kids! Play dough is always a win in our house! 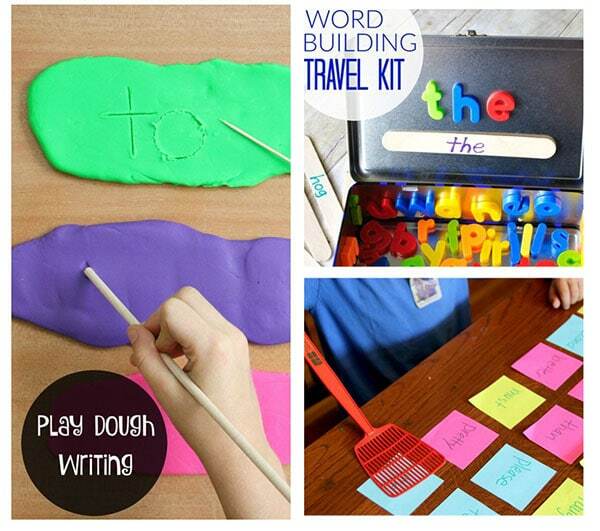 I love how this play dough writing tray incorporates play dough fun with word work! As you can see, learning sight words doesn’t have to be boring or monotonous. You don’t have to drill with flash cards every night. 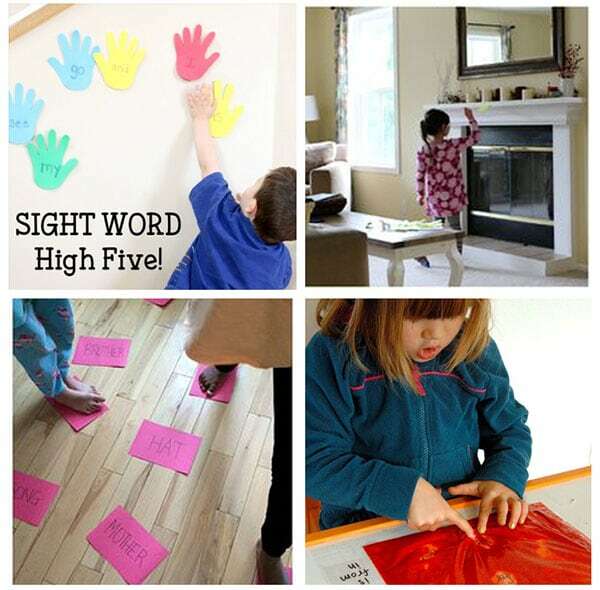 Instead, try out these fun, hands-on sight word activities that your kids will actually enjoy! 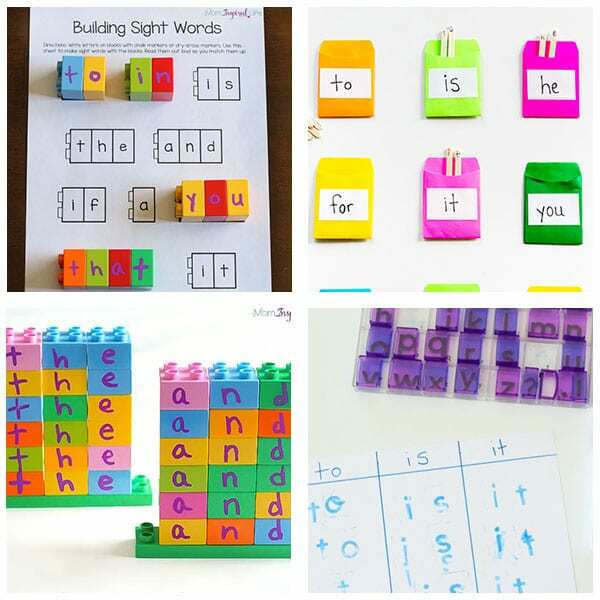 Looking for more fun and engaging ways to teach sight words? 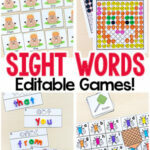 Check out these sight word printables!